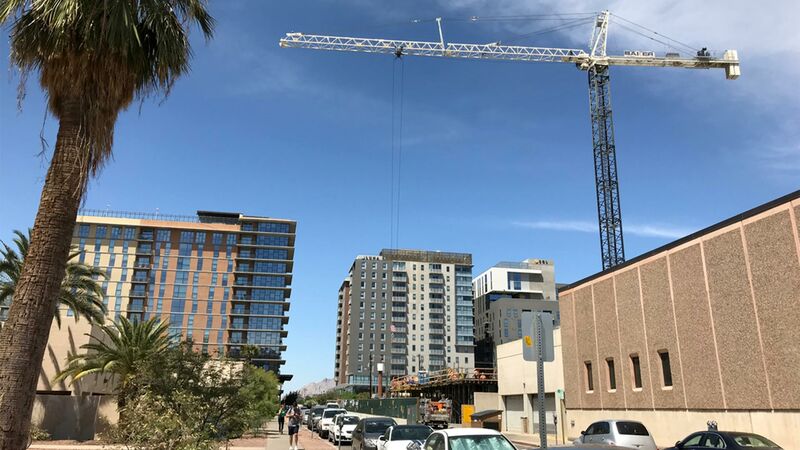 June 6, 2018 / Modified jun 9, 2018 12:07 p.m.
Employment in Tucson is growing at the fastest rate the city has seen in the last six years, sparking a population increase that is feeding the housing market, according to one economist with the University of Arizona's Eller's College of Management. Tucson's employment rate stands close to the national average, and 5,400 jobs were added to the local economy last year, according to George Hammond. "That’s Tucson's fastest rate of growth since 2012," Hammond said. Last year, jobs in Southern Arizona grew by 1.5 percent. The reason for the growth in employment steams from jobs in multiple sectors, Hammond said, including construction, health care, tourism, law firms, computer programming and accounting. "Interestingly, we have seen strong job gains in manufacturing in Tucson, in particular in the high-paying aerospace sectors," Hammond said. "So those sectors have combined to really boost the local economy." VIEW LARGER Job growth throughout Arizona provided by the University of Arizona Eller College of Management. Phoenix outpaced Tucson with a growth rate of almost 3 percent, which is higher than the national average. Growing employment in the construction industry, according to Hammond, reflects overall population growth, which has driven an increase in housing permit activity. 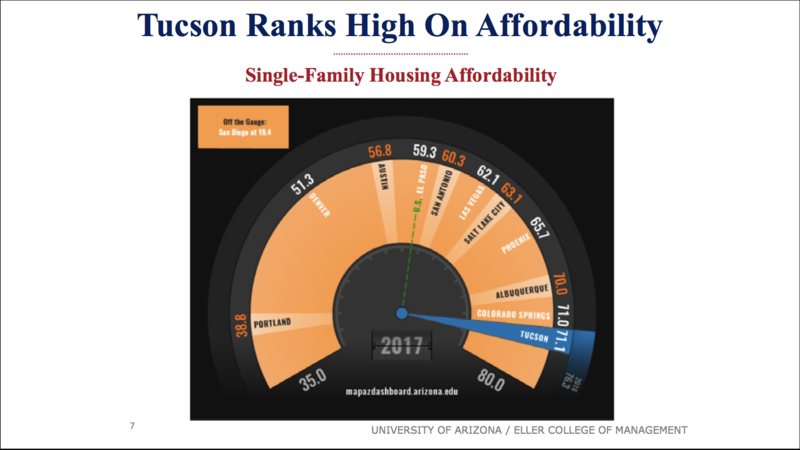 "Tucson has the best housing affordability compared to the other 11 western [metro areas] we track," Hammond said. Last year, housing permit activity reached its highest level in a decade, according to the Census Bureau. However, one area of concern is the rise in building costs on things like steel and aluminum. The costs of these materials are going up because of the Trump administration's decision to impose tariffs on imports like steel and aluminum from Canada and Mexico. VIEW LARGER Single-Family housing Affordability among 11 western metropolitan areas. "Tariffs on these intermediate inputs like steel and aluminum are the worst of the bad ideas," Hammond said. "It makes our manufacturers less competitive globally and it drives up costs for everybody." In a recent comparison of the U.S. dollar and Mexican peso, Hammond says research shows over the past four years the U.S. dollar has risen by 40 percent on the Mexican peso, making it more expensive for companies in Mexico to purchase from Arizona exporters. "What happens when the dollar appreciates versus the peso, is it makes dollar-denominated goods and services more expensive to Mexicans. When that happens they tend to buy less of U.S. goods and services, including those available for sale in Arizona," He said. Right now the Mexican currency is a little under 20 pesos per US dollar and the peso continues to lose value. Hammond says that could harm Arizona businesses because large companies in Mexico purchase more than a third of all Arizona exports. UPDATE: This story was updated June 7 to include a quote from George Hammond about the impact of the dollar-peso exchange rate on Arizona.